Tuning your corporate travel and expense policy to both protect the bottom line AND keep your road warriors productive and safe during business trips can be a difficult balancing act. Tuned too far to one side, your policy offers no flexibility, no common sense to deal with the realities of short-notice sales trips and customer visits. Tuned too far to the other side, you’ll be paying exorbitant fares for direct flights and four star hotels. While it’s easy to right a prescriptive policy for normal operations, very rarely does a policy look at business realities for last-minute travel like an upset customer or the chance to close a large deal. 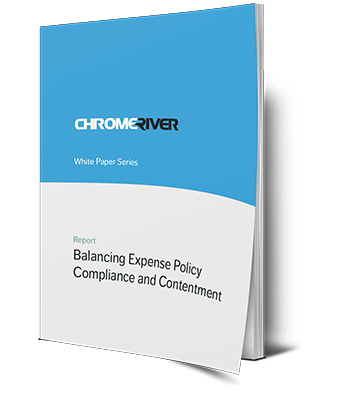 This new whitepaper shows both sides of the coin and how to draw a balanced policy between the two. It even suggests opportunities for perks and ways to thank weary business travelers for their service. In the best of all possible worlds, our business travelers would feel free to do what’s necessary to keep customers happy and be as productive as possible while on the road. Travel managers would also see compliance with preferred vendors and cost containment with their negotiated rates. When both travel managers and road warriors are working together for the common good of the organization, the travel and expense policy helps each achieve their goals. Use the form to the right to download this helpful whitepaper and start crafting a policy that is both respectful of the company checkbook and respectful of the employees. Then the only thing you'll have left to say is Take me to The River!